It’s a hard job, but somebody’s got to do it. I’ve just returned from a week of cruising on the Amalfi Coast, a region of southern Italy known for its stunning views of the Tyrrhenian Sea, delicious seafood and the local speciality liquer–Limoncello. Though my trip was in late March, the tourist (and sailing) season doesn’t really get cranked up until mid-April. However, from my base in the cliffside town of Positano (pictured at left) I got to experience first-hand the rich maritime history of this region, and scout out the must-see destinations for a cruiser or charterer. Positano’s relationship with the sea goes back to its founding. According to local legend, Byzantine pirates were sailing by with a stolen Madonna icon when a terrible storm whipped up. They heard a mysterious voice shouting, “Posa, posa!” which means “Put down! 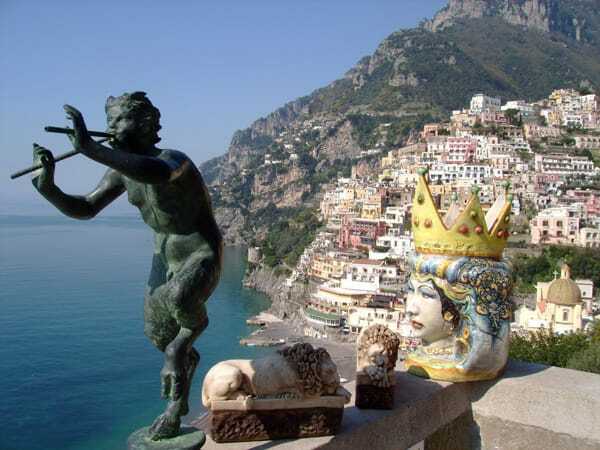 Put down!” They landed at Positano, then a tiny fishing village of the Amalfi Republic, and that icon can still be seen in the town’s cathedral today. One of Positano’s most famous native sons was the sailor Flavio Gioja, who invented the modern compass. Though some scholars doubt he even actually existed, this hasn’t stopped the people of Positano from naming nearly everything after him. For a while in the 15th and 16th centuries Positano was a major medieval port, under constant attack by Saracen pirates, but by the 20th century it had become a poor fishing village once again. It wasn’t until after WWII, when John Steinbeck visited and wrote an essay describing it as a “dream place” that Positano became what it is today–a charming sightseer’s destination. 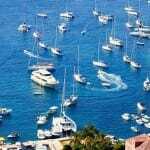 Most Amalfi coast sailboat charters (both skippered and bareboat) are based out of the major cities of Naples to the north and Salerno to the south. Positano and Amalfi Town have a few of their own charter companies as well. For the visiting sailor, Positano is a delight. Just a few miles off the coast, and clearly visible, are the famous Islands of the Sirens from The Odyssey. Unlike Ulysses, you won’t have to plug your crews’ ears with wax and lash yourself to the mast as you sail by. There is no marina in Positano, but the harbor is calm. 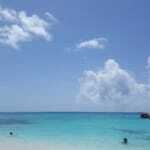 Several excellent restaurants and cafes line the beach, so you won’t have to walk far to get a great meal. I recommend Chez Black for great mussels and clams and friendly waiters who will always bring the dessert cart by. If you need to stretch your legs after being onboard, you will find no shortage of paths, alleys, staircases and piazzas to explore. Positano is full of boutique stores and cafes, so pace yourself. The town is built into a cliff, and that’s all the excuse you need to stop for a cappuccino or a beer and admire the view. It’s not a big place and you can see most of it in a few hours. 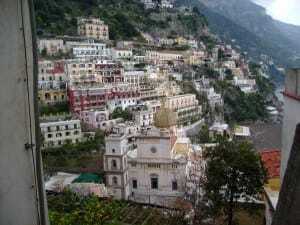 Nevertheless, it would take months to discover all of the little nooks and crannies Positano has to offer. 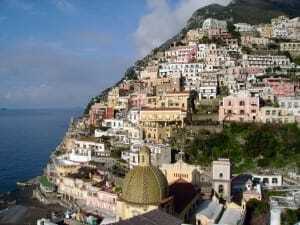 There are many other excellent places to see on the Amalfi coast between Naples and Salerno. Amalfi and its neighbor Ravello are also cliffside towns home to spectacular gardens and churches, while Sorrento and Vico Equense on the Bay of Naples are more like normal Italian towns, grids of narrow streets full of vibrant foot traffic. Sorrento does have a proper marina, though a small one. Naples itself is a teeming metropolis full of history and beauty, but watch out–it has a very depressed economy and can be a rough place for the visitor who doesn’t know their way around. Many people also stop at the island of Capri, a very touristy locale but one with stunning views. The very brave can even ride the rickety chairlift to the top of the mountain! If you have a day to devote to it, the astonishingly preserved Roman city of Pompeii is a worthwhile experience. 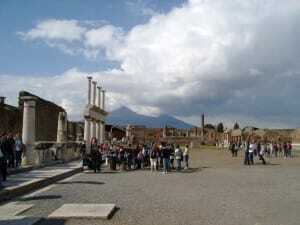 We all learned about the eruption of Mount Vesuvius in school, but seeing the place firsthand is amazing. Nowhere else on earth can you find such a clear example of how ancient people lived their daily lives. 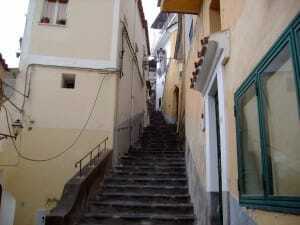 Hire one of the expert Campania region tour guides to explain what you’re looking at. These guys are pros, and there are very few signs or plaques at Pompeii. The most important thing to remember about visiting this part of Italy is just to relax and go with the flow. Don’t try to do everything, just go where the wind takes you. It’s very hard to have a bad time here. Spend hours over dinner, sit and ponder the view, strike up conversations with local shopkeepers. You’re living la dolce vita.